Whether you are working to solve a unique organizational issue or making a contribution to theory, the research methods framework will help you align the “DNA” of your study to deliver the insights that you need. “I use terms like ‘canvas’ and ‘design’ because research requires both analytical and creative knowledge, skills, and abilities. There is no one best way to conduct research and the answer to ALL research methods questions is, ‘it depends. '” (Latham, 2014). The Research Methods Framework section is an online resource designed to help researchers of all types design a custom research methodology for their particular project. 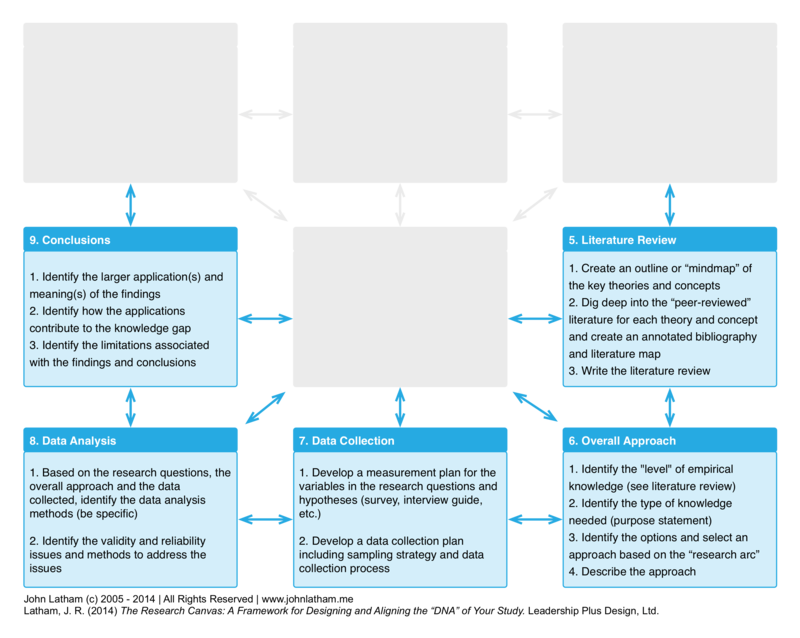 While the research framework is organized into nine components with clear linkages, the process of developing a good research design is an iterative and often “messy” process. Each of the nine components is linked to the previous and subsequent components and all components are linked to the conceptual framework. The component are organized into two groups – the “T” or foundation of problem, purpose, research questions and conceptual framework and the “U” or methodology including the literature review, overall approach, data collection, data analysis, and drawing conclusions. All too often new researchers will begin their design process by asking questions like, “could I use an existing survey to measure ______ with population ________?” This is the wrong place to start. Form follows function and the methodology follows the purpose of the research or the “T” or foundation. Step one is to get the “T” or foundation right. 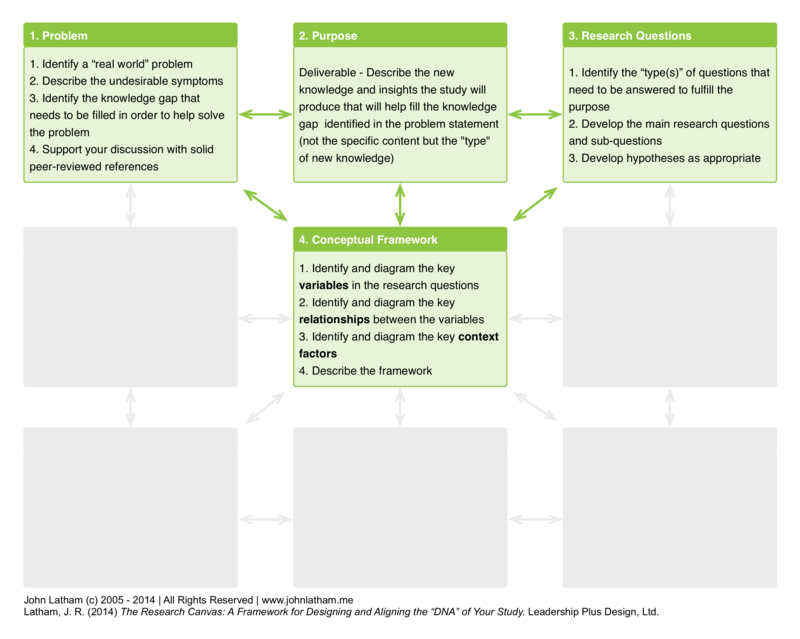 The T or foundation consists of four related components including: (a) the problem (real world symptoms and specific knowledge gap); (b) the purpose of the study to help fill that knowledge gap; (c) the research questions; and (d) the conceptual framework. Once the foundation is fairly well developed you are ready to start working on how you will answer the questions in a credible way that will fulfill the purpose and add new insights to help us solve the problem. 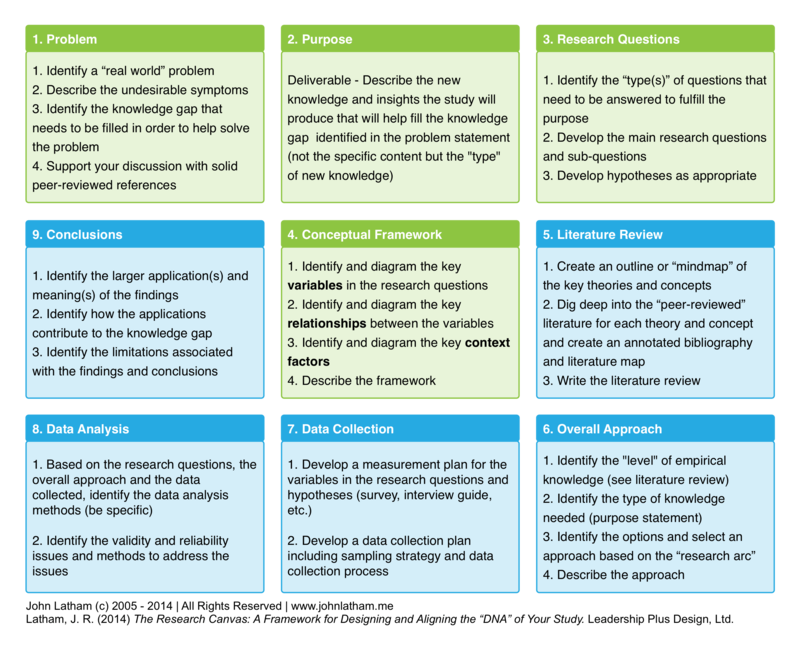 The U or methodology is composed of five key pieces including: (a) a complete literature review; (b) the selection of an overall research approach; (c) the specific data collection methods and instruments; (d) the specific data analysis methods and procedures: and (e) drawing conclusions. Whether you are taking one of one of my graduate courses in research methods or just interested in exploring the research methods content on this site, this is the resource page for you. This resource page provides a convenient “one-stop shop” of many of the research methods resources found on this website. Explore the Research Methods Resources.